Sometimes we get to ship two awesome items together because one just might not be enough. Take for example this vintage sanforized flannel shirt and US-made Eastland camp mocs. And what’s that peeking out from the corner? Why it’s a selvage bandana! Thank goodness for selvage bandanas, and for Jamie Bannon, who taught be how to take better photos. Read the letter below. Camp Mocs: There’s not really a standard term for the one-eyed hand-sewn, but camp moc is used by enough brands to give me confidence. These are vintage Eastlands. They feature whip-stitch construction in the toe, a cushioned leather footbed, rubber sole, and brass hardware. They are made in the USA (if hold the insole up to the light, it’s readable) and in excellent condition, as evidenced by the depth of the stitching channel on the soles. They are a size 10, which was the smallest size you listed. I err down with these in anticipation of stretch and socklessness. 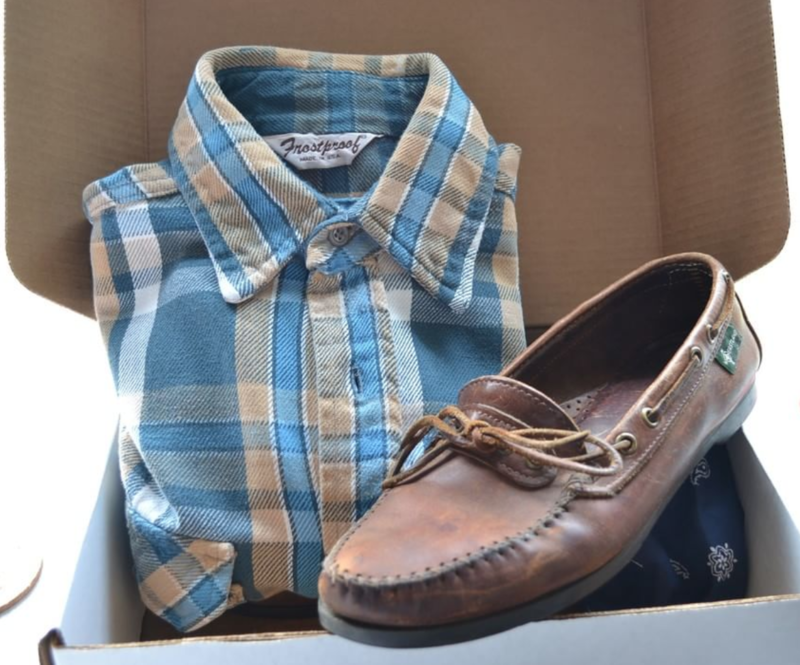 Flannel Shirt: Sanforized plaid flannel shirts are a staple of our business, and I’m glad to send one in your first box. This one is from Frostproof, one of countless American shirt brands to slowly disappear, and features their script logo. It has a pleasant mix of blues and tans in the plaid along with white and black to go with twin flap pockets and a point collar. 100% cotton and made in the USA. Selvage Bandana: There’s not much to say about this, aside from the fact that I hope it gets used. 100% cotton and made in the USA.